In appreciation for not being cut back too severely even though they were sprawling all through the perennial garden last year, the perennial sweet peas (Lathyrus latifolius) are beginning to bloom. I didn't take a picture of the whole patch, as it may cause some to wonder about my sanity in allowing this plant to sprawl as it does in the perennial garden where I put it. However, I can hardly blame the plant. I have not planted it in the type of garden that best suits it, and I'm the one trying to make it conform. It would rather be someplace where it can really let loose and sprawl all over and self seed with abandon. Like on a hillside where nothing else grows, or along a fence in the sun. I'll have to evaluate at the end of the season what the "damages" are from continuing to let this sweet pea flourish where it is. "Damages" might include finding some struggling perennials under all the sweet peas or finding way too many pea seedlings come up in way too many other places. In the meantime, I'll just enjoy this for another year. It's pretty, flowers freely and with abandon, and reminds me of sweet peas that grew at my grandparent's house. It's like a misbehaving child of the family whose parents don't see or won't see how bad they really are, but all are entertained by their antics. 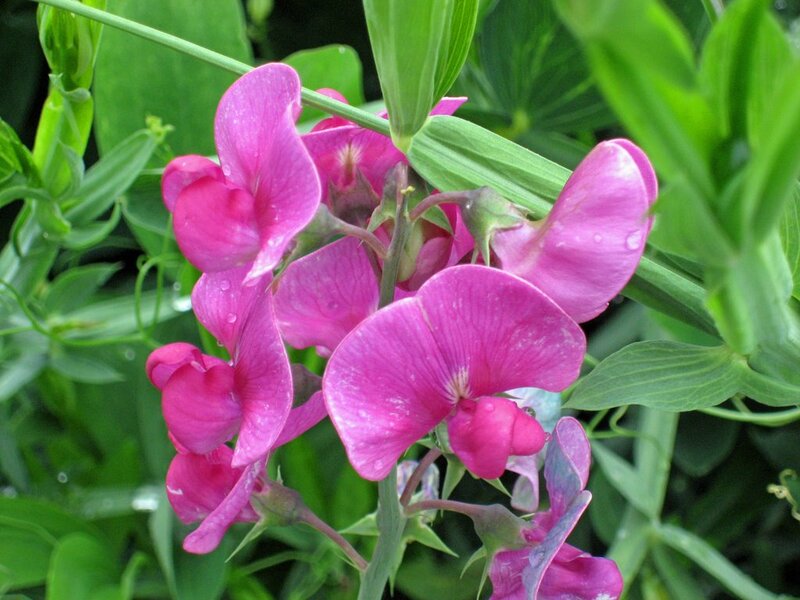 This sweet pea is a member of my garden family, so I just can't throw it into the compost bin! See My Garden Pictures for a new post showing all the hoe pictures together! I have never been able to get sweet peas to sprout. You were right, that weed is bitter nightshade. Have you read the book "The $64 Tomato" by William Alexander? If you haven't, you should you would probably enjoy it. No gardening today. I transplanted my vining sweat pea this year, and it doesn't like the new location. Can I transplant it again now, or is it too late? I look at it this way. If the plant is struggling in its current location and is going to die anyway, how much worse can it be to move it to someplace where you think it might do better? The worst that happens is it dies, but it was going to anyway. I can provide new starts in the spring and plent of them.